November 23, 2017 - Fairport, NY, USA: Saelig Company, Inc., (Saelig) (www.saelig.com) has introduced four new members of Pico Technology's PicoScope 9300 family of sampling oscilloscopes. With up to 25 GHz bandwidth, the PicoScope 9300 series addresses digital and telecommunications applications of 10 Gb/s and higher, microwave applications up to 25 GHz, and timing applications with a resolution down to 64 fs. The new 15 GHz models replace the preceding 9200 Series 12 GHz models, with significantly upgraded specifications at lower prices. The 9301-15 gives the benefits of two channels at 15 GHz bandwidth and a prescaled trigger to 14 GHz. The 9301-15 delivers a 16-bit sampling rate of 1 MS/s for fast-update eye-diagrams, persisted traces, histogramming, and statistical analysis. Its equivalent sampling rate extends to 15 TS/s with a time resolution of just 64 fs. The 9302 15 version adds a Clock Recovery trigger to 11.3 Gb/s, with RMS jitter typically down to 1.0 ps + 1% of data interval. For single-ended Time Domain Transmission and Time Domain Reflection measurements, the 9311-15 version is a significant upgrade to its predecessor model 9211 for cable, component, backplane, PCB impedance, transmission characterization, and network analysis. And at 20 GHz, the Model 9311-20 supports fully-differential and deskewable TDR/TDT measurements. All 9300 models can be paired with the PG900 standalone fast pulse generators to achieve similar TDR/TDT capability. The 9300 family is also compatible with Pico Technology's low-invasive PicoConnect 900 passive probes, capable of probing signals to 9GHz or 18Gb/s without interrupting downstream functionality. Pico Technology has also created the 25 GHz Model 9302-25 which adds 11.3Gb/s clock recovery. This supports 5th harmonic assessments at data rates to 10 Gb/s, and16 Gb/s at the 3rd harmonic when a clock or sub-clock is available. Full touch screen control, menus that configure to the application at hand, comprehensive PRBS pattern lock, and eye-line step and scan all create powerful yet cost-effective instruments for visualization, measurement and characterization of high-speed serial data. These USB-controlled sampling oscilloscopes, designed for working with repetitive signals, are a low-cost alternative to extremely expensive high-end GHz benchtop scopes. 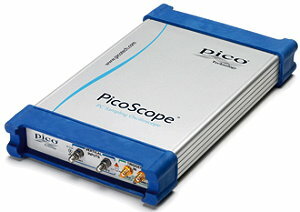 The PicoScope 9300 series offers affordable high-integrity options for viewing and measuring RF and microwave signals, signal paths, and RF networks, and are a cost-effective solution for working with gigabit-per-second data-streams and their copper, wireless, and optical fiber interconnects. Made by Pico Technology, Europe's award-winning oscilloscope adapter manufacturer, the new PicoScope 9300 Sampling Oscilloscopes are now available now from Saelig Company, Inc. their USA technical distributor.